Way back in 1999—a thousand years ago in Internet years—a writer and designer, named Darcy DiNucci, coined the phrase Web 2.0. This marked the beginning of the web as a social experience, eventually altering commerce so that today customers can be brand advocates who play a crucial role in building your business. You already know that your customers are talking about your brand on social media platforms, posting images from your product pages to Pinterest, and checking reviews. The brick-and-mortar and virtual commerce experiences have become so intertwined that customers sometimes make an online purchase while standing in your store. 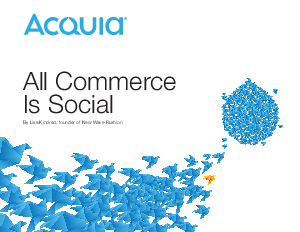 So, there's no question that all commerce today is social, and this ebook will dive deeper into that concept.